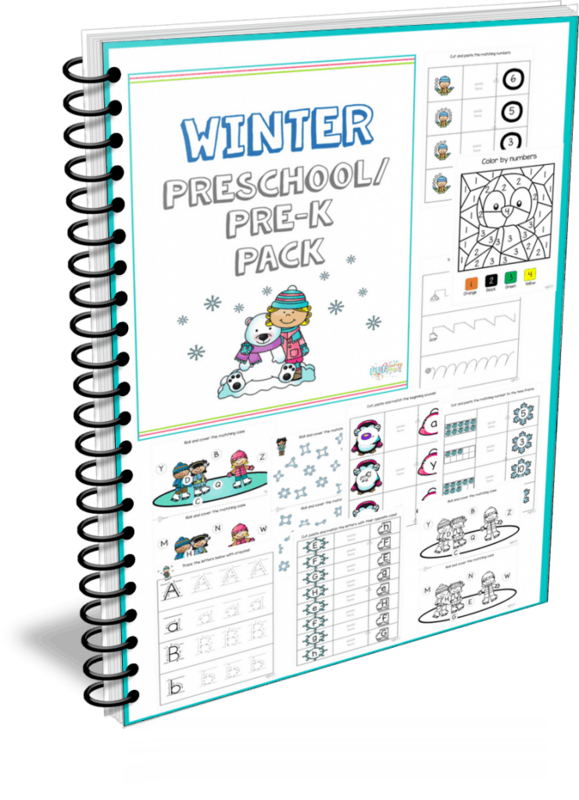 Looking for a set of free printable winter counting activities? Can you believe its already winter? We still get temperatures in the upper 80s and 90s around here, but I know that there are many places where it definitely feels like winter. 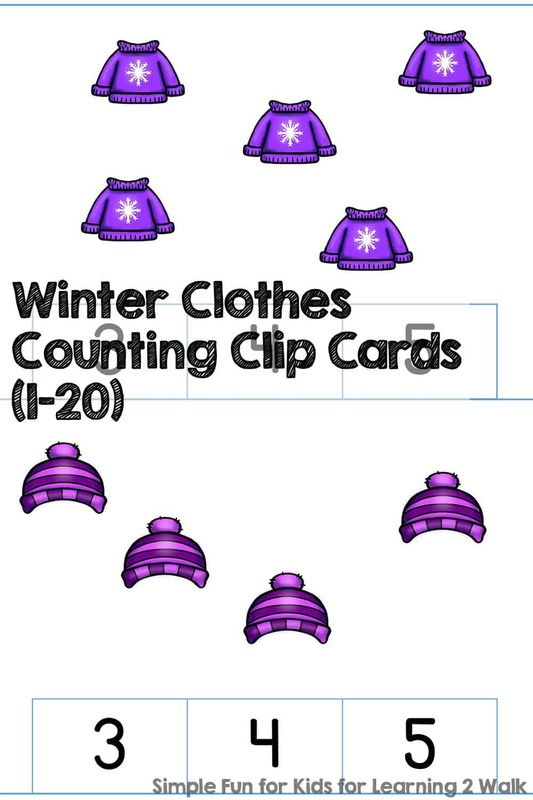 Whether you’re already in the midst of it, just dreaming of cooler temperatures, or even if you’d rather skip winter altogether, I’m sure you’ll enjoy these Winter Clothes Counting Clip Cards (1-20)! This printable consists of five pages with four clip cards each. The twenty clip cards represent all numbers from 1 to 20. 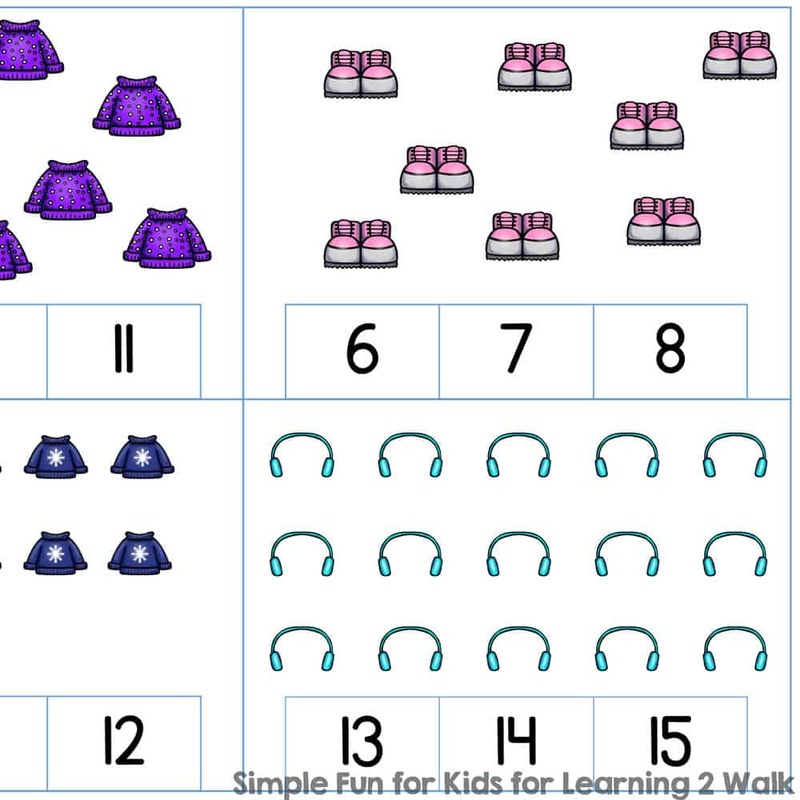 In accordance with Kindergarten common core standard CCSS.Math.Content.K.CC.B.5, numbers 1 to 10 use a scattered configuration, while numbers 11 to 20 are presented in a rectangular array. then cut the cards apart. Provide clothespins to mark the correct answers. If you don’t have or don’t want to use clothespins, you can offer other tools like dry erase markers, stickers or manipulatives. In that case, you have the option of leaving the printable pages intact and using sheet protectors instead of laminating for reusability. For more counting practice, check out these FROZEN counting worksheets (1-10), this Counting Cars Numbers 0-5 book, or this Farm Animal Counting 1-10 printable! You’ll find a ton of Kindergarten printables here. For all printables from Simple Fun for Kids, click here. About the author: Hi, I’m Tina! I have a toddler and a preschooler, and I blog at Simple Fun for Kids where I share simple ideas for crafts, sensory, science and art activities, and printables for kindergartners, preschoolers, toddlers, and babies. We’re from Germany but currently live in Texas. Come on over to get to know my kids, my blog, and me better!